Forty years ago next week marked a historic point in Soviet-American relations. On May 22, 1972, President Richard Nixon landed in Moscow for an unprecedented week-long summit with Soviet leader Leonid Brezhnev, Premier Alexei Kosygin and other Soviet officials that culminated in the SALT I Treaty and marked the height of the détente era. In honor of this four decade anniversary, I thought I’d write about an insightful publication by the State Department entitled “Soviet-American Relations: The Détente Years, 1969-1972” that covers this important period that marked a détente or a “thawing” of Cold War relations between the two superpowers. Extremely interesting are the forewords by both Nixon’s Secretary of State Henry Kissinger and Soviet ambassador Anatoly Dobrynin. In them, they talk about their personal relationship that forged “The Channel” of communications between the two governments that finally led to the breakthrough in negotiations. On March 25, 1971, according to the transcript of a telephone conversation with Soviet ambassador Anatoly Dobrynin, I remarked: “When we are both out of government service, which will be a lot later for you than for me, I hope you will let me read the reports you send in on me.” … My remark to Dobrynin was an interlude in what evolved into almost daily exchanges. What was later named “The Channel” began as a general exchange of views. Starting in 1971, the Channel became the principal venue for U.S.-Soviet relations. President Nixon’s visit to Moscow (May 1972), at which agreements, the most important of which were a treaty regulating Ballistic Missile Defense and a five-year freeze on deploying additional offensive strategic weapons, were concluded. The two sides also published an agreed statement on principles of international conduct. 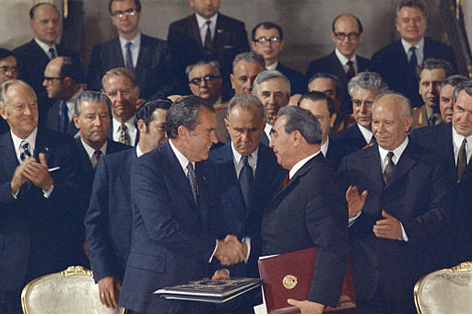 Image: Nixon and Brezhnev shake after signing the SALT treaty on May 26, 1972 (Source: Corbis Images). The highlight of the publication is the discussion about the lead-up and issues during the Moscow Summit and the final negotiations of the SALT I Treaty. SALT I, the first series of Strategic Arms Limitation Talks, had begun in November 1969 to explore ways to halt or reduce the arms race, particularly nuclear weapon proliferation. This week of meetings from May 22 to 26, was set up after those years of negotiations to finalize and sign a number of agreements that increased cooperation and reduced the mutual nuclear threat between the two nations. On May 26, Nixon and Brezhnev signed the Strategic Arms Limitation Treaty (SALT I), the most significant of the multiple agreements reached during the Moscow summit. 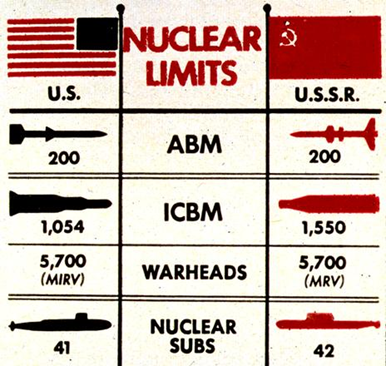 The terms of the SALT treaty limited the USSR and the United States to only 200 anti-ballistic missiles each, which had to be split between two defensive systems. Among all the handshakes at this Moscow summit was another for the “Agreement between the Government of the United States of America and the Government of the Union of Soviet Socialist Republics on Cooperation in the Fields of Science and Technology” which laid the groundwork for the first joint Soviet-US space flight. Called the Apollo Soyuz Test Project or ASTP, the ASTP flight lasted only nine days from July 15-24, 1975, but led to another famous handshake… this time in space. 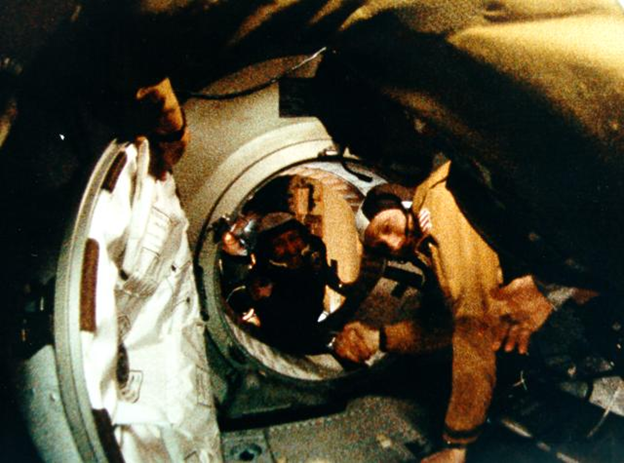 Image: Photo of the famous handshake between Astronaut Thomas P. Stafford (f.g.) and cosmonaut Aleksei A. Leonov after a successful linkup in space of the Americans’ Apollo and the Soviets’ Soyuz spacecrafts on July 17, 1975 (Source: NASA ASTP gallery). All in all, this publication provides unique insights from the players involved about the diplomatic communications and procedural changes and innovations that were put in place on both sides to eliminate the logjam in relations between Soviets and American administrations since the end of World War II. And sometimes these changes were done “outside” the normal processes. For all the bureaucratic dismay it caused, the Channel was an innovative attempt to transcend the formalities of an increasingly bureaucratized diplomacy. It helped contain crises, saw America through a period of domestic divisions and sketched prospects for a more peaceful world. 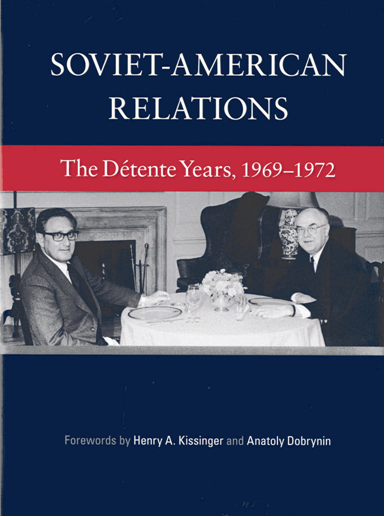 HOW DO I OBTAIN “Soviet-American Relations: The Détente Years, 1969-1972”?